The past decade has been very kind to the Batman franchise. After wildly successful films and videogames, it seems that the series can do no wrong. 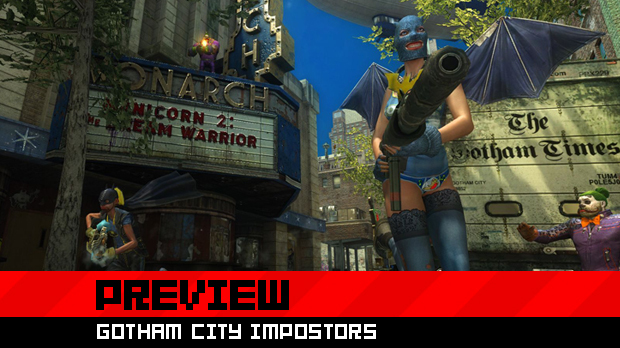 Riding high on this wave of confidence is Gotham City Impostors, a drastic departure for the Batman series that takes a campy, legitimately funny tone on this usually dark license. 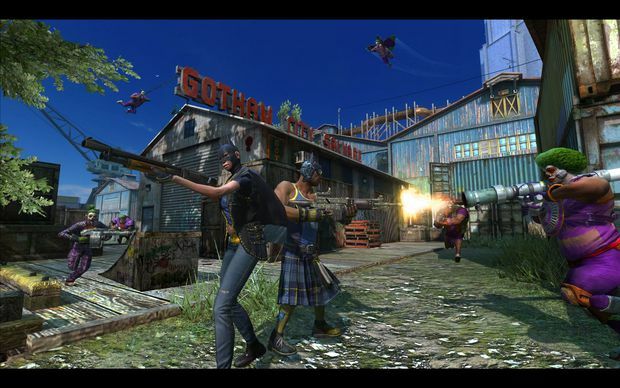 For those unfamiliar, Gotham City Impostors is an arena shooter coming to us from Monolith Productions. Known more for their recent work on the F.E.A.R. and Condemned series', Gotham City's cartoony and colorful tone is its most striking aspect. From the exaggerated facial expression of the Joker gang to the ludicrous weapons of the Batman impostors, the games oozes with camp. Like all arena shooters, most of the fun is found with the games online modes. There is a single-player portion to the game, but it's relegated to series of challenge maps meant to familiarize players with the game's more novel mechanics, such as gliding and grappling. You can go back and play challenges to post faster times and earn better medals, but the meat of the game is in the online component. 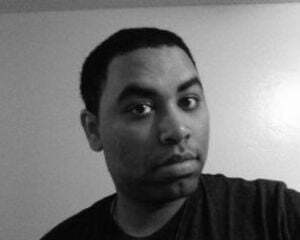 There are tutorials to help you learn the ropes too and even that has an added flair to them. Rather than static text telling you what button does what, Impostors features animated short films that play like early black and white cinema. For example, a screen of text explains how to glide from a rooftop, then a ten second clip shows a rendition of Batman gliding and crashing into a wall, Looney Tunes style. Like I said, it oozes with camp and fits well with the game's wacky style. Like most FPS games, Impostors has all the weapon and class customization you would expect. You play matches to earn experience and levels, then customize your loadouts in between matches, unlocking better weapons and equipment as you go. You can also customize your avatar from their gender, body type, and a plethora of clothing options. Some of the customization is faction specific too, like Jokers can choose from a list of hair styles and grimaces, while the Bats can switch up their capes, cowls, and bat symbols. Choosing a body type is particularly important as it determines your amount of health, equipment, and abilities. For example, heavies can soak up more damage but they can't glide or grapple. While the game does allow you to play however you want, it's probably best to round out your team with a good amount of heavies and more nimble players. As cool as the customization and setting is, the gameplay itself felt lacking. While perfectly functional, the gun play in Impostors isn't the smoothest, but more worrying is that the game's modes run the usual gamut of team deathmatch, control points, and capture the flag variants. 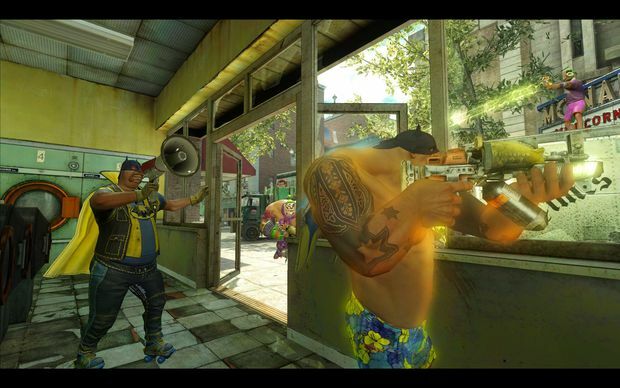 Without any unique modes, Imposter doesn't have a whole lot to differentiate its gameplay from other shooters. The sole standout mechanic during my hands-on time was the ability to glide and grapple. Grappling and gliding in Impostors are simple enough to pull off and their use can have a great effect on the outcome of matches. You can glide by equipping a lightweight character with a cape and catching drafts from vents placed around the match. It's by far the fastest way to travel and particularity effective in objective based modes like capture the flag. Grappling is a simple as pointing your reticule at a surface and rappelling up towards the nearest rooftop. Its a great tool for deathmatch as you can rack up a nice amount of kills if you get creative and experiment on the best spots to set up shop. I love shooters and I love Batman. 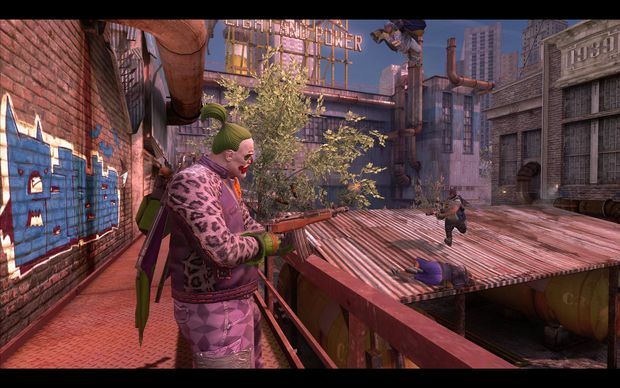 After my time with Gotham City Impostors, though, my feelings are completely mixed. The grappling and glide mechanics certainly give it a different feel, and I like the campy, tongue-and-cheek tone of the game. At the same time I can't get over the feeling that this may end up being just another FPS, and the first misstep in Batman's otherwise impeccable run this past decade.